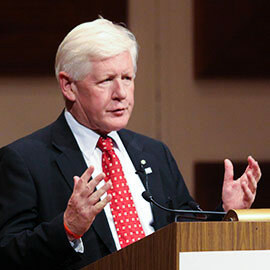 BRANTFORD – Bob Rae, former Ontario premier, Ontario Liberal Leader, and past chancellor of Wilfrid Laurier University, will be in Brantford Nov. 16 for the second public lecture in a series about First Nations residential schools and the results of the Truth and Reconciliation Commission. Rae's lecture, entitled “Healing Hearts and Treaties,” will begin at 7 p.m. in Room RCE 004 in the Research and Academic Centre, Laurier Brantford, 150 Dalhousie St. Rae currently works with First Nations as an advisor, negotiator and legal counsel. He is the author of five books and teaches at the University of Toronto. The free public lecture series is presented in association with Laurier Brantford and sponsored by the Friends and Neighbours Group, a grassroots committee of area residents supporting the Woodland Cultural Centre's Save the Evidence Campaign. The campaign, which runs until next spring, is raising money for repairs and renovations to the former Mohawk Institute Indian Residential School building at 184 Mohawk St., one of the last remaining residential school buildings in the country. Rae serves as the honorary patron of the campaign. “The goal of the lectures is to educate people and promote a community dialogue about the school and reconciliation,” said Rob Knechtel, vice-chair of Friends and Neighbours, who is co-ordinating the series. Wednesday, Jan. 25, 2017 - Justice Gethin Edward: A Justice and Reconciliation. Justice Edward was named to the Ontario Court of Justice in Brantford in 1996. He led the creation of the first Indigenous Persons Court in the province, where offenders are sentenced based on principles of restorative justice. Tuesday, Feb. 28, 2017 - Amos Key Jr.: Saving the Evidence to Save the Witness. Key is First Nations language director of the Woodland Cultural Centre and an assistant professor at the University of Toronto. He is a staunch advocate of the rights of Indigenous people and promotes social change, social enterprise and entrepreneurship to improve the lives of indigenous people. March 2017 - To be announced. At the opening lecture on Oct. 19, about 100 people heard presentations by the Honourable Elizabeth Dowdeswell, Lieutenant Governor of Ontario, and historian Nathan Tidridge. The Mohawk Institute was the country's first residential school and operated from 1828 to 1970. After it closed, it reopened in 1972 as the Woodland Cultural Centre. Recently, major roof leaks have caused significant and costly damage to the residential school building. So far, the Save The Evidence Campaign has received financial support from the Six Nations Elected Council, the City of Brantford and the Province of Ontario as well as other individuals and organizations. About 150,000 First Nations children were removed from their homes in the 19th and 20th centuries and sent to the mainly church-run schools, sometimes hundreds of miles from home. The children were forced to abandon their own language and culture in order to be assimilated into Canadian society. They lived in substandard conditions and endured physical, emotional and sexual abuse. When they ultimately returned home – sometimes after a decade or more – they were outsiders in their own communities. The Truth and Reconciliation Commission, led by Justice Murray Sinclair, delivered a report in 2015 that contained 94 "calls to action" on ways that all people – Indigenous and non-Indigenous – can work to heal the wounds left by the residential school system.